There were a few beetroots lying around in the refrigerator for a while now, and my wife has been reminding me about them repeatedly. 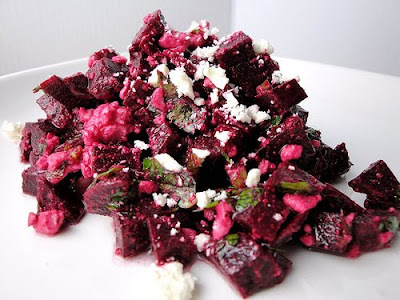 Thankfully I wasn't at a loss as to what to make, and ended up preparing a very simple beetroot feta salad as a side dish for lunch yesterday. We ate up most of the salad as soon as it was prepared. Peel the skin off the beetroots, using a peeler. Wash the roots and boil them in water for 10 - 15 minutes until they are just cooked. Let them cool down. Dice the beetroots into 1/4 inch size pieces and put them in a bowl. Add the feta cheese (crumbled), lemon juice, olive oil, parsley, and salt and pepper for seasoning. Toss well together. Salad is ready. This is a very refreshing salad with the sweetness from the beetroots, saltiness from the feta and the citric flavor of the lemon juice complementing each other really well, overseen by the freshness of the parsley. Serve cold or at room temperature. Note: Beetroots are strictly a no no for diabetics (being one myself), as they shoot your blood sugar levels up rather quickly. Although the portion size here is very small, please tread carefully if you are a diabetic.